When a toucan in Costa Rica was attacked by a group of teens, he lost the top part of his big, bold beak. Beyond efforts to keep the bird, named Grecia, comfortable and help his wound heal, rescuers are doing much more — thanks to 3D printing technology. When word of Grecia’s attack went viral on social media, donations poured into Rescate Animal Zoo Ave, the wildlife rescue facility caring for him. But several companies also reached out to the rescue center, offering their services for 3D printing. Now, a design team is working on plans for a printed prosthesis that will allow the bird to eat on his own. Although there’s no guarantee that Grecia will accept the prosthesis, these tech professionals are intent on trying. 3D printing is more than one bird’s heartwarming rescue story — it’s also becoming a big business. Sales of 3D printers and services could reach $6 billion around the world by the year 2017, consulting firm Wohlers Associates told Inc. Magazine in 2013. The costs to get into 3D printing vary greatly. A commercial printer for working mechanical parts or prosthetics could cost between $20,000 and $60,000, Inc. reports. Personal hobby or small-project printers like the Makerbot Replicator cost about $2,000. It’s not a small sum, but it could be a manageable startup cost if you have a great business idea. Ranging from life-saving to lifehacking, here are a few business opportunities that didn’t exist before the advent of 3D printing. Will you get in on this business trend? Fed up with the one-size-fits-all earbuds that came with your iPhone? Apparently, you’re not the only one. Normal offers custom-fit, 3D-printed earbuds. At $199, they’re not cheap, but the new technology allows a price point far below that of other custom headphones, which can cost more than $1,000. So weird, in fact, that most hearing aids are already being 3D printed. The process of scanning the ear and making molds for the eventual complete device used to take about a week, Kathryn Doyle reported for Quartz. 3D printing has reduced that process to a single day. Some companies are now offering 3D printed fetuses as souvenirs for expectant mothers. WolfPrint, a 3D printing specialist, has become quite popular in Estonia, where it works with medical facilities that offer 3D ultrasounds in order to generate the data required to print figurines. In the United States, 3D Babies offers four-inch figurines for $250 and eight-inch figurines for $550. Both can be generated from 3D ultrasound images or from newborn baby photos. Grace Choi launched the Mink makeup printer last spring. It doesn’t print out lipstick canisters, but it does allow users to pluck their favorite colors from their computers or phones and print eyeshadow or lipstick shades. The printer is designed for young makeup fiends, and while it’s still an invite-only tool, Mink costs less than $200. Shapeways opened its 3D printing factory in New York in 2012, but it’s been offering on-demand printing services since 2008. The marketplace connects shoppers with designers of 3D printed objects, and allows designers to upload their products for production. Buyers can provide feedback to designers, who can make adjustments and continue to sell their wares through the site. What kinds of items are for sale? Products range from tech toys to jewelry to home decor pieces, but most notable may be a 2014 partnership with Hasbro to 3D-print My Little Pony fan art. Staples has begun offering 3D printing at several locations, and UPS rolled out the service to 100 locations last fall. While pricing is elusive, UPS explains that projects are priced based on complexity, and estimates that printing an iPhone case would cost about $60. Printing a consumer project could take a few hours, or more than a day. Home decor giant Martha Stewart is getting in on the fun as well. Her company worked with printer manufacturer MakerBot to offer a line of printer filaments in exclusive colors, along with a set of patterns that you can buy from the MakerBot site for about $2 each. But printing those patterns for coasters or votive holders won’t be cheap: a two-pound roll of filament in robin’s egg blue will cost you $65. Want a cheaper option? The Washington DC Public Library offers 3D free classes about the ins and outs of 3D printing, then charges patrons by the gram to print their 3D creations. 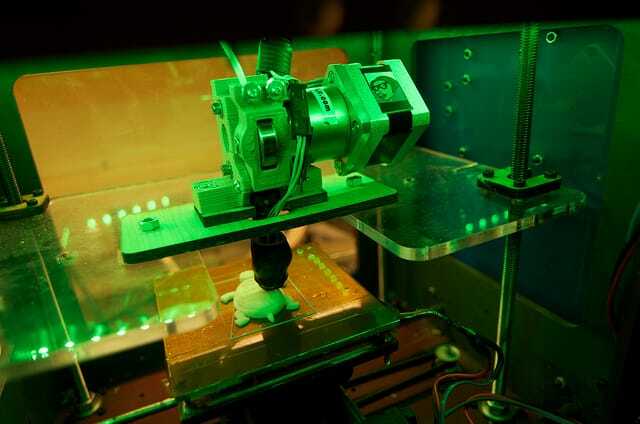 The library estimates that most 3D objects printed by users cost $1 to $5. If you have an idea for a business based on 3D printing, one of these options might help you create a prototype and test your product.